One of the easiest ways to improve the look of your kitchen is by changing the countertop. It can be either a solid centerpiece that catches everyone’s eye, or the one design foundation that ties everything together. Either way, the choice of countertop is a crucial one. The first choice you’ll have to make is that of what material to use. When it comes to quartz countertops, there are plenty of choices out there, and our showroom in Edmonton can help you make your decision. In the countertop debate between granite and quartz, granite is often a first choice for aesthetic reasons. But when it comes to the beauty of the countertop, there’s no reason at all to ignore quartz. Quartz countertops can look like almost any natural stone, and will always look exactly like it did in the showroom. This combination of consistency and beauty is a unique characteristic of quartz. Unlike granite (which is 100% natural stone), quartz countertops are 93% natural stone. The other 7% (called resin) and the engineering that goes into making a quartz countertop make them superior in strength to their all-natural counterparts. If your kitchen is going to be used as it should, your quartz countertop is going to be ready. Another perk of engineering a natural stone is that you can offer much more variety. Unlike granite, which is taken from a quarry and shipped to a warehouse, quartz is available in a wide variety of colours. K&J’s Custom Granite in Edmonton has three different quartz manufacturers. To give an indication of just how much variety quartz has to offer: one of the manufacturers offers 24 different shades of white and beige alone! In the debate between granite and quartz, quartz has one trump card: cost. The cheaper varieties of granite are close to the average price of quartz, but in many budgets, it will be hard to find the exact piece of granite you’re looking for. Between the high end countertops, quartz is a affordable option. 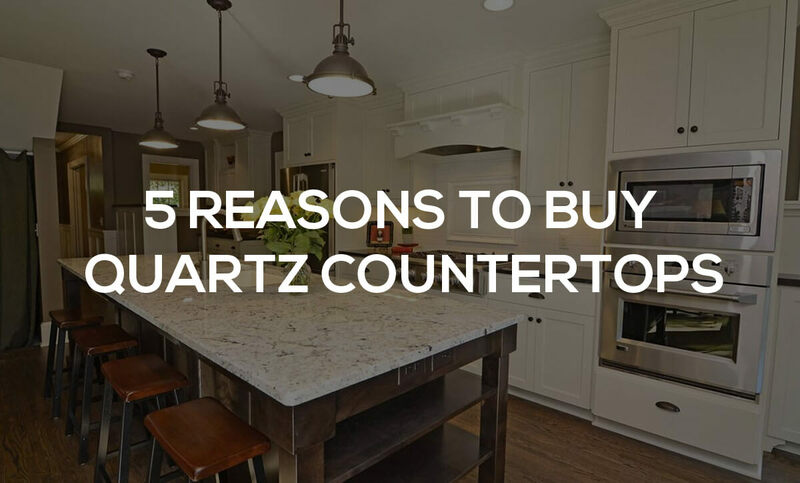 Combined with all the other unique benefits, buying a quartz countertop is a true bargain. The last reason to choose a quartz countertop is a matter of daily life. Using a kitchen almost always means making a mess, and the best messes are easy to clean. Unlike natural stone countertops, quartz is nonporous and nonabsorbent. This means that your messes have nowhere to go and can be easily cleaned up. Not only will this make your countertop look great for many years to come, it also is a lot more hygienic. Not only cleaning, but maintaining a quartz countertop is also a lot easier than natural stone. Granite needs to be sealed upon installation and then regularly resealed. Quartz is also resistant to scratches, making sure that maintenance is even needed less. We hope these reasons to buy quartz countertops have helped you on your search for the perfect kitchen. If you have any more questions, or are ready to find your perfect tint of quartz, come to K&J’s countertops showroom in Edmonton and let our design experts help you make the perfect decision.